On Behalf of a Ten-Year-Old Girl: “Is This Who We Are”? There are ways in which we can take action. The American Civil Liberties Union is leading a campaign to contact elected officials; the effort has been gaining publicity on Twitter and other social media channels via the #FreeRosa hashtag. We cannot remain silent. It’s not who we are. * Adults must look at the big picture: there are often events in that child’s life that led to the current situation. Children are not disposable. As Korczak said, one must never, ever abandon a child in need. This fine article appeared in the October 17, 2017, edition of The Guardian. Back in 2015, my younger daughter told me about a book she was reading and with which she became entranced. It’s about two misfits, a little boy and a huge dog. Both have physical disabilities. And as each is endowed with a great heart and heaping dose of empathy, they understood each other perfectly. As I love both animals and children with disabilities, I had to buy a copy and read it. I am very glad I did. He remembered the deafening roar of the train as it rumbled over him. Left for dead, an abandoned dog whimpered in the chilly night air. Fortunately, a kind-hearted rail supervisor spotted him and alerted the local animal welfare authorities. A series of veterinarians, nurses, animal shelter personnel, and animal advocates did everything they could to restore normalcy in his life. Everyone who met this dog was taken in by his large amber eyes, which belied his gentle nature. They did all they could for this unusual dog, but they could not save one of his hind legs and tail, making walking and communicating a major challenge for him. Now the problem was who would adopt a three-legged dog, an Anatolian shepherd, a breed most people associate with aggressiveness; even as a puppy, he was a very large dog. Those who met him knew he was a gentle giant. At one of the sanctuaries, the staff realized how loyal this dog was. They thought of a much-loved canine folk hero in Japan, an Akita named Hatchiko, who waited for his owner at a train station, even many years after he passed. They decided on an Anglicized variant, Haatchi. Little did they then realize that the name would suit him perfectly. Will Howkins has a son, Owen, a boy with a very rare genetic neuromuscular disorder. The one dog he had was sweet-natured, but it was not in his nature to cuddle. Will and Kim, Owen’s mother, had divorced; Will was the boy’s primary care taker. Several years, later, Will met Colleen on line; like Will, Colleen loved dogs. One day, while browsing the Internet, Colleen was smitten by the face of an Anatolian shepherd staring back at her with enormous almond eyes. When the couple visited the dog in person, their feelings of love were even stronger. But how would Owen, Colleen’s “Little Buddy,” or “Little B,” react to a dog so much larger than he. They would have to give it a try. Little B was very shy and withdrawn, but when he and Haatchi met, they were in love; Owen became much more lively and outgoing. Soon, the story of the little boy and large dog spread, millions of people having viewed their account on Facebook. This is the book behind the story. Haatchi and Owen had adapted to their disabilities, overcoming a great deal of painful surgery. The two inspired each other with their determination and positive outlook. Throughout the book, each experienced many more setbacks and challenges. In fact, the “happily ever after” is the astonishing positivity of all members of the family. Nobody knows the long-term future of either Owen or Haatchi; for now, however, both are extraordinarily grateful for what they have. That is the story of the family with the boy and his dog, who inspire each other—and will inspire anyone who takes the time to absorb this very enjoyable and highly readable true story. At a time when there are increasingly fewer Holocaust survivors and witnesses, the last year has seen a surge in anti-Semitism and other forms of racism and bigotry (such as White Nationalism) on the rise. Of even greater concern, these forms of bias and hate are moving from the fringes to the mainstream. The Washington Post recently called on Congress to take action. These worrisome trends have had at least two Holocaust museums re-examine how they present their collections. The first involves a young girl, a name world famous but a history often misunderstood. 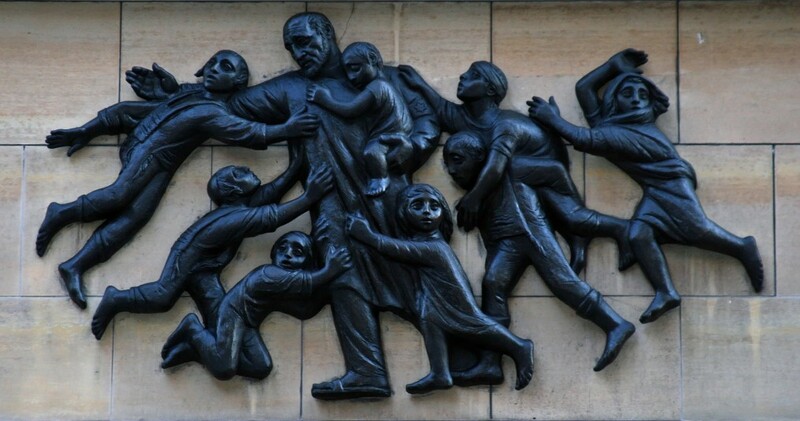 The second commemorates the ghetto uprising in Korczak’s home of Warsaw. Although attendance at this Amsterdam landmark has increased sharply over the past seven years, the curators have noticed that many of the younger and foreign visitors have a limited knowledge of the Holocaust and Anne Frank. The challenge, according to and article in the New York Times, is how to make this history relevant to today without trivializing it. The museum has expanded both its exhibition space in an building adjoining the old house and its educational outreach efforts, especially to enable these audiences to experience the what happened in the house. The museum also has traveling exhibitions, such as the new “Let Me Be Myself.” Anne Frank has long been a metaphor for hope and the belief in the inherent goodness of people even in the worst of circumstances. Central to the U.N. Convention on the Rights of Persons with Disabilities (CRPD) is “respect for the inherent dignity, individual autonomy including the freedom to make one’s own choices, and independence of persons… and full and effective participation and inclusion in society” (Article 3). This concept is reflected in this year’s theme for World Autism Awareness Day, “Toward Autonomy and Self-Determination“. In opening the conference, Cristina Gallach, U.N. Under-Secretary-General for Communications and Public Information, said “We come together to renew our commitment to raising awareness of the rights of persons with autism – to equal opportunity and full participation in society, on an equal basis, with other citizens. To achieve this inclusive society that we aspire to, we must… ensure that the fundamental rights enshrined in the CRPD are respected.” This is a right that has been recognized since the Universal Declaration of Human Rights was declared in 1948. The keynote speaker, Simon Baron-Cohen, Director, Autism Research Centre, University of Cambridge, was gave an overview of the autism spectrum. In regard to the “commitment to leave no one behind,” Jackie Pilgrim, a noted disability advocate spoke about dignity. In her work with NAMI Durham she spoke of her organization’s new 8-hour course for police and first-responders to replace the inadequate 1.5 hour course used previously, one for which they have shown “passion” to learn. In other words, “autistic behaviors are human behaviors.” This landmark book will be covered in the next post on this blog. Added Micheal John Carley. The best way to help is to examine ourselves and change the way we view people with autism. That ribbon made of multicolored puzzle pieces has become one the most recognizable symbols of autism in the world. The various colors reflect the many “faces” of autism, a condition often referred to as the autism spectrum disorder (ASD) because no two people with autism are alike. (The cognitive abilities of people with ASD range from “nonverbal” to intellectually brilliant.) The ribbon symbolizes solidarity and hope of a happy, fulfilling life for people with autism. The puzzle pieces remind us that the condition and the people with it are still very much a mystery. “Make it Stop.” This is a brand-new awareness video to foster understanding of people with autism. “Perfectly Normal,” is a film about Jordan, a man with Asperger’s, who discusses his everyday life, of which the New York Times publicized an important excerpt. Photo by James Gordon, Los Angeles, California, USA: “Playful boy in the expansive courtyard of the Great Umayyad Mosque of Damascus, Syria” Public domain, via Wikimedia Commons. This mosque, the fourth holiest place in Islam, is now in ruins. On Saturday, January 27, Trump issued his now-famous executive order banning residents of seven designated predominantly Muslim nations from entering the United States. Noteworthy is the fact that the order contains the phrase “foreign terrorist” but not “refugees.” Among these foreign terrorists detained was a four-month-old infant in need of open-heart surgery, and a one-year-old with cancer. In fact, world wide, children, already among the most vulnerable, are suffering in disproportionate numbers. What do we mean by “extreme vetting”? A Homeland Security official explains that refugees have been been vetted thoroughly all along. The report offers facts about undocumented students, immigration raids, what school communities can do, and taking action beyond the classroom. A companion piece, “What Do I Say to Students about Immigration Orders?” offers clear, honest tips for helping undocumented students and children of undocumented parents. This thoughtful essay offers ten additional steps of constructive action teachers and other adult role models can take. On Wednesday, February 1, Trump cut a call with Australian Prime Minister Malcolm Turnbull short, refusing to honor America’s earlier pledge to take in 1,200 refugees. These are the refugees who had been relocated to the Papua New Guinea island of Nauru. The refugees consist mainly of families, many children among them. Witnesses – both the children themselves and the human rights group Amnesty International – describe the conditions there as inhumane. Meanwhile, Samantha Bee had to put aside her humor in her scathing segment that night. Then, again, so was Trevor Noah, using the same c-bomb. Bana Alabed, thankfully safe, had a poignant question for the president, seeking his empathy. Bana is the brave little Syrian girl who has been using Twitter to alert the world of the plight of these children, now political pawns subject to the political whims of egomaniac adults. The video can be found here. Please follow her! Bana’s mother, Fatemah, has also set up a Twitter account. Mother and daughter preach love, peace, and understanding. These are the message we need so much more of. Here’s the full, uncut version of the famous advertisement by 84 Lumber. It’s beautiful!